Y’all this chicken is SO GOOD! It has everything! 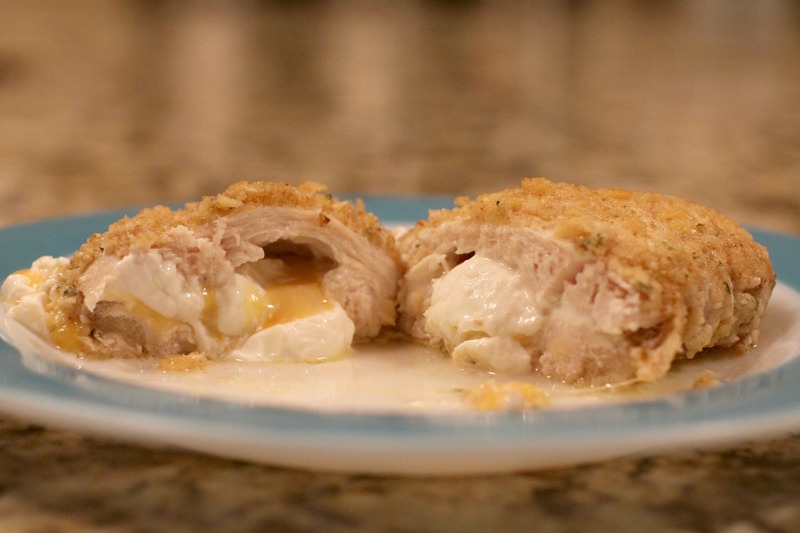 It’s a symphony of flavors: chicken, cream cheese, melted cheddar, a crispy breading, lemon, and garlic…oh man. We really loved this dish! Anyways, the recipe posted below is the original, but I’ll tell you about a couple changes I would make if I were to do it again. First of all, make sure that you have large breasts (hahahaha) because if you don’t, it will be very difficult to fit all the stuffing inside. Next, I think you could easily reduce some of the calories in this dish. It calls for 6 Tbsp of butter, but I thought that was too much. Most of the melted better stayed in the baking dish anyways and wasn’t even on the food. I would use less butter, and I would gently brush it on rather than pouring it. That way you can control how much (or how little) goes on each breast. Lastly, instead of mixing the minced garlic in with the melted butter, I’d spread it on separately. All my garlic was clumped together in the bowl with the butter mixture, and it came out in one big heap. Then I had to just scoop it up and spread it out myself. Next time I make this (and there WILL be a next time because it was awesome) I’ll try to remember all of these modifications, and it will be EVEN BETTER! Preheat oven to 350 degrees F. Lightly coat a large, shallow baking dish with non-stick spray. Pour milk into a shallow bowl. In a separate bowl, combine breadcrumbs and Romano (or parmesan) cheese. Carefully dip each breast first in milk, then in breadcrumb mixture, patting lightly to firmly coat. Place breasts side by side in a single layer in pre-oiled baking dish, tucking edges under to seal. Combine butter, lemon juice, and garlic, and drizzle evenly over chicken. Season breasts with garlic salt. Thanks Sean! 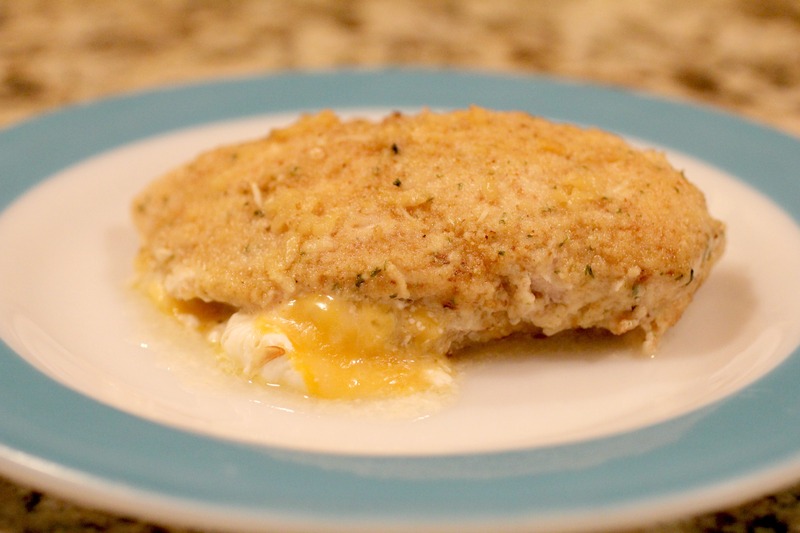 It’s one of my favorite chicken recipes!